Meet Renee from Mama and Bump! Renee and I met working as Baker's Delight chicks at 19 and have been friends since. Renee was a girl I knew I would do life with and so we forced our then boyfriends now husbands to become best mates, and as our families have grown, so has our friendship. At 19 while working the Thursday night bread selling shift, Renee shared her dream of one day owning her own business. It has been so exciting to see this dream unfold as she has raised three kids, studied and supported her husband Matt's Jim's Painting business, never giving up through the tougher seasons and staying patient, just waiting for the right time in her busy life. So the time arrived with Mama and Bump launching and I just couldn't wait any longer to tell you about it. This Adelaide massage boutique for pregnant mums and postpartum is perfect for any mamma in need of a special, looking after or 'you' time treat. Enjoy the article and when you head in for a massage with Renee, mention this article and you will receive $20 off any massage over an hour Woo Hoo! Apart from being a mum, what do you do with all the free time that you don’t have? I’m usually drinking coffee or casually massaging anyone standing close enough to me, haha. Both of which I seem to do so naturally these days. My hubby has learned that if he stands or sits next to me long enough, I will start massaging his back and then he stays put until I have to stop. It’s so funny. When I’m sitting on the couch, my youngest will pop his feet onto my lap as he knows he will get a foot massage. I’ll be at a party and before I know it, I’m making my way around to anybody who has light enough clothing on so that I can glide my knuckles along their back muscles. I don’t go out much, haha, is it obvious? I started Mama & Bump in March of this year. In 2014 I took the plunge to resign from my long-time, secure office job and follow my dream of opening my own business. I studied for 18 months to gain my qualifications in remedial massage and specialised pregnancy massage with the vision that I would open a cosy little place that women could come and feel nurtured and looked after through massage therapy. I’ve always been so intrigued by pregnancy, it’s fascinating to me. To be able work with pregnant and postnatal women on a daily basis is the best. My love of necklaces has followed me too, I have a small shop front where I sell a handful to items that appeal to my clients. I always found through my own pregnancies, especially by the end, that a necklace could make you feel like you were wearing a new outfit, despite wearing the same clothes day-in and day-out simply because they fitted and they were comfortable. I started thinking about being a mum at about 19 years old. I can’t say many of my friends could relate at the time, haha. To be honest, I used to imagine it often. I used to imagine what my life would look like with a baby in tow, and as I drove to work, I would daydream as I watched parents walk their kids to the local primary school. Isn’t if funny how crazy you can look when you actually write these sorts of things down, I must sound like I have nuts in my head, haha. I have one brother and family has always been important to me. I have always liked the thought of a big family. Still to this day, if I meet someone at a gathering who is from a large family, I will chat with them for as long as they let me about their childhood and family. I always imagined I would have four kids. I’m a proud mum of three, so I nearly made it, haha. Not so much of a rule but more of an expectation, parenting has taught me that despite our best intentions and strong influential abilities, everyone has a mind of their own and encouraging my kids to be themselves, not the child I imagined them to be, has been a big thing. More and more I see the amazing talent seep out of my kids and I sit back and think ‘I didn’t teach them that, they have that within them’. So allowing things to flow rather than setting specific expectations is definitely one. When I was growing up, days off school were for if you were so ill, you couldn’t physically remove yourself from bed that day. I also thought that I would carry that same rule into motherhood. I did for a number of years but as the family grew and I realised that sometimes just a day off school here and there is needed to press the refresh button. Don’t get me wrong, I don’t encourage them, but if I can see that one of the kids is emotionally struggling, I will grant them a day. It helps that my work is much more flexible now, and I can accommodate this leniency too. The one rule I have stuck to is eating dinner every night at the table together. With such busy lives, this is the one time we are all guaranteed to be in the same room at the same time for a decent duration, to then be able to catch up on each other’s day. We usually go around the table and say our favourite part of the day. Don’t get me wrong, there are still arguments going on about how many more mouthfuls somebody needs to eat before they can be excused, or convincing somebody to eat the meal that I just spent the last half an hour preparing, but it is probably my favourite part of the day. The love and the laughter! Every day offers something new. Don’t get me wrong, I have my days, but they are worth it for all the little moments. I love seeing my kids grow into their own person, they inspire me with talents that I wish I had, they make me appreciate life for what it is and every now and then I will hear them repeat something that I told them while sharing my limited wisdom, and I will feel amazing because I taught them something and they actually listened to me, ha ha. That doesn’t always happen. Apart from the usual challenges of trying to get my kids to brush their teeth, eat their vegetables, try new things, tidy their rooms and so on, accepting that all mums parent differently and being okay with that has been one of my biggest hurdles. I always questioned myself with how I was rating as a mum compared to others, but at the end of the day I have learned or at least still trying to be okay with the fact that if I follow my heart and do what I feel is the right thing, I’m definitely doing alright. The opinions of mums who are close to me have always been important to me, but I have come to realise that what works for one family might not be the solution for another – and that’s okay. Being able to be confident in my own decisions even if at times I feel like I’m standing alone has been a challenge at times but empowering all the same – especially when you know you’re doing the right thing by your child and your family. On a day-to-day basis though, my biggest challenge is keeping on top of my housework! Before kids, I kept a very tidy house. I never thought my house would look like it does now, lego everywhere, dishes on the sink, unmade beds, the list goes on. I like to think that a happy house is a messy house, ha ha, well that’s what I tell myself anyway. This is a tricky one for me to answer, only because so many mums influence me in so many ways, and its an ongoing thing. I’m always chatting to mums about their struggles and solutions they have found, and some I have taken home to try, others not so much. I was told early in the piece that everyone wants to give you advice whether you want it or not, it's up to you to sift through the advice, take what you need and forget about the rest. I still go by this motto, I think its working well so far! organise your week and day? Im not sure if I'm a good person to answer this. The last 12 months particularly during my study were the busiest for me and housekeeping fell by the waist side. #1 - Perhaps my advice for a happy household is to not sweat the small things. We might not have been on top of everything but we made sure there was time for the important things when they popped up and didn’t lose sleep over dishes that didn’t get done for example. #2 – Write lists that are reasonable and achievable. This way things got done, mostly those that were high priority and boxes were ticked – always good for sense of achievement. Hold back on trying to do everything in one day. Even ‘cook dinner’ was on the list. If my family were eating a good meal in the evening, that was sometimes an achievement in itself. #3 – Don’t be afraid to ask for help or accept help. I would have loved to have thought that I was completely capable of running a house, studying full-time, starting up a business and keeping up with parental duties all on my own while Matt worked everyday to bring some money in, but that just wasn’t reality for me. Help with school drop-offs or pick-ups, a load of washing here and there, really helped me out at times. This is a hard one to answer, so many moments to choose from! I think the one moment that made me really amazed was a post that my 12 year old daughter posted on her Instagram account. Instagram is the only social media she has been allowed to have and she has used it because of her love for photography and art. However on my last day of study a few months back, she put up a post, she copied my Instagram page with my bio details on it and she said ‘Congrats @renlouspi01 for officially finishing TAFE. I know your business will do amazing and will thrive over the years to come. Everyone let your mums know about @mama_and_bump pregnancy massage (Also includes remedial massage). Mama & Bump is a newish business so help out and let everyone know about it because it deserves to be recognised.' She didn’t tell me she was posting it and she just waited for me to find it as I scrolled through my feed. I think I was just amazed at her support for me, its usually the other way around. It was a moment for me to realise that through my actions I am making a difference to her, showing her that you can be a mum and start your own business. You can decide later in life that you want to change your career direction and that’s okay. I hope that I am teaching her through my actions to follow your heart always, make mistakes and laugh them off and try again until you succeed! What is some information you can give to pregnant mums about massage during pregnancy. Are there risks? Are there certain times you can't have one? What are the benefits? Pregnancy massage can occur at any time throughout the pregnancy when the mother is feeling well and able. It is a very safe treatment to receive and offers many benefits. There are a number of things a trained massage therapist must take into account to ensure there are no risks for the mother-to-be before receiving the massage. This will depend on the pregnancy itself and any complications that the mother may be experiencing. Anyone wishing to have a pregnancy massage should ensure that their therapist is trained in pregnancy massage as this will ensure that the therapist is well informed of the physiological changes that occur throughout a pregnancy and the conditions that can occur during this time. A trained therapist will have a thorough discussion with the mother about her pregnancy and her health to ensure that she is provided with the most appropriate treatment. In some high-risk pregnancies, pregnancy massage may not be suitable but this is very much determined with the advice of the mother’s doctor or midwife. 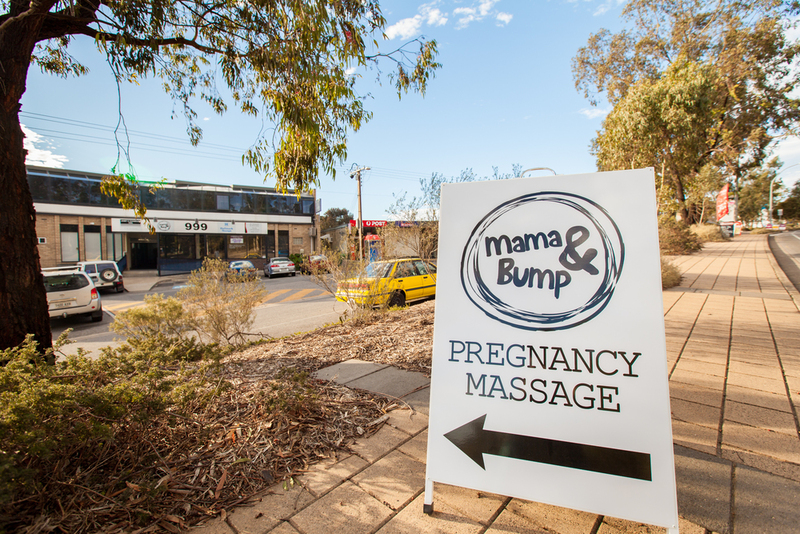 Mama & Bump is located in the North East of Adelaide, at Shop 4, 999 Lower North East Road, Highbury. You can find all the details on the Mama & Bump website: www.mamaandbump.com.au Mama & Bump is also on Facebook and Instagram.